My plan was to get up early to go to the gym and life weights. The Astros and the Dodgers had other things in mind. Game 5 of the World Series was supposed to be a tidy pitchers’ duel. Instead it was a slug fest. Houston won 13 – 12 in 10 long innings. I pretty sure there were at least four standing 8 counts. You could almost hear the players saying, “Yeah, Well…TAKE THAT!” as they exchanged home runs. Big fun. Long story short, I woke up a tad later than planned. As it turned out, this was not entirely a bad thing because temperatures dropped about 20 degrees from yesterday. And it was windy. Fall has arrived and, boy, does it feel great. I managed to make the four-mile ride to the gym into eight miles. I let the breeze push me down the Mount Vernon Trail before turning back. Then I had to face it. The dreaded weight room. I know, I know. Weight bearing exercise is good for you. It especially good for people like me who do little more than non-weight-bearing exercise and who have ripened a bit. I did one circuit through the machines, mostly to figure out how to set them up. It was pretty funny that one some machines I wasn’t sure which way to face, toward or away from the machine. And there was one work station without any weights at all that had no instructions. I had no idea what the heck to do with that. After my first go round, I did another circuit. I made sure to use less weight than I might normally and to move the weight very slowly. I hope I don’t ache tomorrow. Even with low weight, I had the same result I usually have from weight lifting: I felt like throwing up when I was done. The good news is my ribs didn’t hurt. The bad news is my left tricep is messed up. It wasn’t the weights. My father had rotator cuff problems beginning at about my age. Thanks Dad. After the weights, I went for what I planned to be a 22-mile ride. 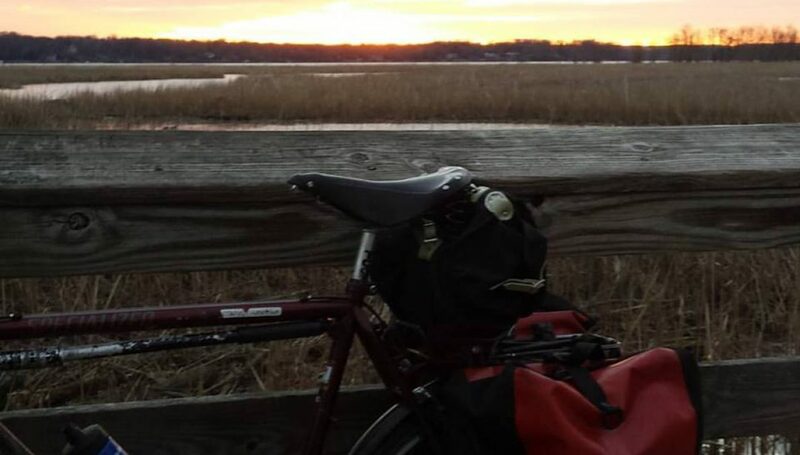 One thing led to another and I found myself riding The Mule all over the place: across the Potomac on the Woodrow Wilson Bridge, up Oxon Hill past the casino, back down to the river at Oxon Hill Farm, back up the hill to Martin Luther King Jr. Boulevard. I took MLK to Howard Road. Then I got on the Anacostia River Trail. I rode a few miles north then crossed the river and came south all the way to the soccer stadium being built at Buzzards Point. Then I made my way to The Wharf where I rested in a swing and took in the sights on a perfect fall day. The ride home on the Mount Vernon Trail was a breeze. When I arrived a package greeted me. The package also included a book (Britt Maire Was Here by Fredrik Backman) and another CD, Little Fictions by Elbow (I am going to their DC concert on Saturday).